Movie Churches: European Vacation II: Boo-worthy or Award-worthy? One thing I appreciate about European film culture is their willingness to boo films. Even (especially) at film festivals such as Cannes, if the audience doesn’t like what's on the screen, they let their feelings be known. 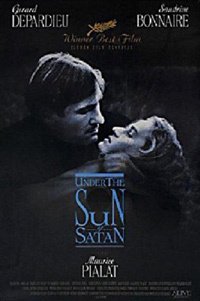 When this week’s film, Under the Sun of Satan, screened at the 1987 Cannes Film Festival, it was booed by many, but it went on to win the Palme d’Or, the top prize of the competition. Directed by Maurice Pialat and starring Gerard Depardieu, the film is based on a novel by Georges Bernanos, the Roman Catholic writer who also wrote the film that was the basis of The Diary of a Country Priest. This film tells another tale of a troubled priest living in a small town in France in the 1920s. 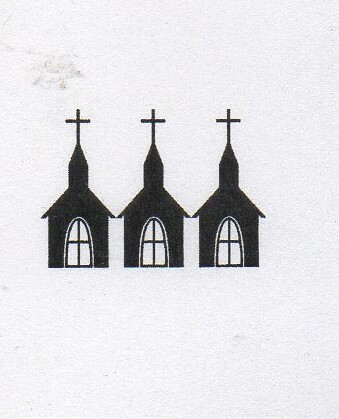 He has a hard time relating to his congregation and frets that he's not a good priest. 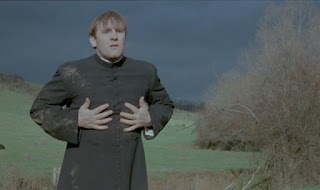 He wants to be a good priest, but he seems to hate himself, is racked with guilt, and we see him whipping himself and wearing hair shirts. On the other hand, we see him kicking around a soccer ball with children. Along with Donnisan’s story, we follow the story of Mouchette, a young woman who becomes the mistress of powerful men in her community. She becomes pregnant and is confronted by one of her lovers, and she shoots and kills him. Eventually, Mouchette and Donnisan meet and she mocks him. He tries to share with her the hope of the Gospel. “Keep your sermons to yourself,” she tells him. He agrees to baptise the child when it is born. The priest becomes more depressed and hopeless, but Mouchette is even more depressed and hopeless. While the priest is going to see her again, she cuts her own throat. To the shock and scandal of the congregation, the priest drags the dying woman to the church, but she dies before she can confess her sins. The priest is even more despairing, and in his prayers, he offers his life and his soul in trade for the people of his congregation (reminiscent of Paul’s willingness to be cursed for the Jewish people in Romans 9). A woman visits Father Donissan to plead for the life of her son. The boy has meningitis and dies, but the priest prays for him and he is resurrected. The congregation hears the news and is revitalized by this hope. But then, as Father Donissan is hearing a woman's confession, he dies in the confessional. A word, "FIN" appears on the screen. If I ever make a feature film -- not likely -- it will have a sad, oblique ending, then the word "FIN" on the screen, because that is what European art films are all about. 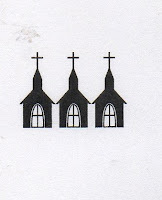 Though Father Donissan loses a steeple for the hair shirts and the self-flagellation, he still earns a Movie Churches rating of three steeples for his desire for God and passion for his people.